Nigerian unions have called off their national strike after a turbulent week. The Nigerian government have been forced into a partial climbdown, and have reinstated 60% of the fuel subsidies that they scrapped at the start of the year. Trade unions in Nigeria have called off their national strike. The follows a partial climb down by Nigerian President, Goodluck Jonathan. On Friday, the unions gave the government an ultimatum. Either reinstate the subsidies by Monday, or oil workers would go on strike. Nigeria relies on oil for over 40% of its GDP, and any such move would have crippled the economy. After a week of strikes, demonstration, rallies, workers clashing with police, numerous deaths, injuries, and arrests, the government have reinstated the fuel subsidies that when originally scrapped, led to the troubles. Unions are describing it as a victory for the workers, who have seen little or no benefit from living in an oil rich country. Today’s developments are not a total victory, as the subsidies have been reinstated to around 60% of the previous level. However, in a country where most people live on less than $2 a day, it makes a huge difference. 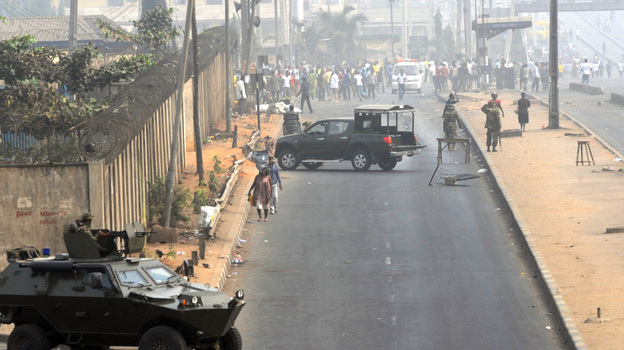 Early in the day, the government deployed soldiers across several Nigerian cities, and fired live rounds into the air, in an attempt to stop marches and rallies starting again following the weekend break. So it was a surprise to Nigerians when the President announced his climb down, as when they had seen the soldiers, they feared the worst. In a way it's good news that they have achieved some concessions. However, I don't think it's accurate to describe this as a victory. Of course, the unions have described it as a victory, much as they do here when employers propose some sort of cut the workers, unions and workers object, maybe put up a fight and then the employer's comeback with a slightly less worse offer, which the unions accept. Then the unions get to claim victory, and the employers are happy as they have cut their costs and got what they wanted. I think we should avoid playing this game, and recognise that for workers this was a defeat: they are going to be significantly worse off as a result of this, as their fuel subsidy is effectively going to be cut by 40%. This is of course similar to our current pension dispute in the UK, where unions are claiming to have won concessions, whereas of course us workers are going to be worse off than before. A "victory" for the unions is not always a victory for the working class, because our interests and theirs are not the same. Text of Press Conference, Abuja, 16th January 2012. We note with consternation the military occupation of numerous sites in our towns and cities by military tanks and hardware as if we are in war. Let us tell Peter Isele and Abdul Waheed Omar that the current wave of revolutionary agitation vibrating round the cities across Nigeria is beyond either of TUC or NLC. Let us remind them that while the twin labour unions were scratching their throats to reply the federal government, the Nigerian masses spoke with the highest pitch and the greatest wavelength. Before NLC/TUC called for a nationwide strike, Nigerian youths had been protesting in every cities of the country, from Lagos to Ibadan to Kano and Kaduna. In Ilorin, we lost a life, in Lagos, we lost two, in several other cities, there were casualties. Thus before they become hypnotized and charmed by the air-conditioned negotiation rooms, before they get carried away by the paparazzi covering each of their moves or before they sell their minds on the power table upon which they are discussing a way out, it must be clear to them that the nationwide strike is not the same as the Occupy Nigeria protest. Though they are interwoven and complimentary, the two are distinctively different movements. While Labour is striking to get the government’s reversal of its subsidy removal, the Occupy Nigeria protest is a movement ignited by subsidy removal but focused on the revolution of the Nigerian society. I think that "partial victory" is a bit of a cop-out here. It's a defeat in that the Nigerian bourgeoisie has engineered a massive and successful attack on the conditions of the working class in this country. For the proletariat here (and elsewhere) the "victory" lies in the spontaneous outbursts of struggle and the solidarity expressed in the struggle. I agree with the posts above and particularly Steven's example of the pension issue in the UK, ie there has already been implemented a masisive cut in the state, public and private pensions in the UK.